Hello everyone from Mya and Racheal and everyone here at Fiddlehead Gardens! Sorry for the long silence on the blog front. We've been extremely busy in the field and the blog had to go on the back burner for a while. Plus I (Mya) had a (second) baby boy in October and went on maternity leave so Racheal was flying solo for a while with a full load of installations, maintenance, and holiday festivities to juggle. Way to go Racheal!!! Anyway, we are back at the computer with lots of great pictures and garden ideas and tips to share so please check back. And in addition to our perennial list of personal resolutions to exercise more, eat less sweets, and read more books, we have a list of professional goals which we thought we'd share. 1. Blog more! Hopefully once a week. Post more befores and afters, which are so fun to share. Post more maintenance tips for you do-it-yourselfers out there. And share inspiring plant finds, gardening ideas, and pictures from our gardening adventures. We encourage our readers to comment and send in photos and questions of things happening in your garden as well. 2. We would like to get Racheal's beautiful garden at her house in Bernal Heights on a garden tour. We will get some photos up soon for a virtual tour but she is having a hard time finding any organization in San Francisco that sponsors actual tours, so please let us know if you hear of anything. 3. Hopefully this is the year for me (Mya) to re-do my own garden. Classic shoemaker's shoes syndrome here, but I'm going to prioritize my own home this year because I'm tired of looking at my raggedy garden in its current state. I have a lot of edibles in my garden, so it is an opportunity to show how one can incorporate food production for your family into a small space and still have it be beautiful and organic. 4. Continue to learn about and maximize Bay-friendly environmental gardening practices. 5. Do more design and build of small spaces like patios, courtyards, and small backyards. I am particularly interested in the challenges of small space gardening since I have a tiny garden and lots of requirements for how I want to use it. We love all the new trends in vertical gardening and container gardening and otherwise greening up urban spaces. So we're looking forward to sharing our progress on these various fronts as the year progresses. To kick it off, take a look at the vertical garden pictures above. The first is a succulent-filled picture box that was made (I think) by the fabulous Mike (Teddy) at East Bay Nursery and was on display there for a while last fall. This would be stunning as a focal point mounted on a dark-colored stucco wall. 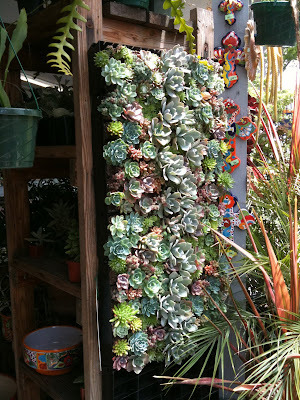 And the second photo is of a vertical garden we built and installed for a client in the Elmwood area of Oakland. The client constructed a fence panel to conceal a trash/utility area and we built a tropical-themed vertical garden on it. They liked it so much that they had us make a second garden panel on the other side of the gate to match. The plants were chosen for their color, ability to tolerate shade, and cold-hardiness/ability to over-winter in our climate, and include some bromeliads, ferns, sweet flag grasses, and shrub begonias. Contact us for construction details if you're interested in replicating this look.